In March, I learned about #onenewthing from Lisa Thumann at the LA County GAFE Summit. I love her message of trying just one new thing, especially when surrounded by so many good ideas. My #onenewthing in March was to try vlogging with students–I took a class to the San Diego Zoo Safari Park, I gave students vlogging prompts, and we all vlogged about our experience. It was new to most students, although once they figured out I was basically asking them to create a Snapchat story, they felt much better. This has prompted me to use #onenewthing as a goal-setting technique for myself. In my summer adventures at different conferences and learning opportunities, including CUE Rockstar Vista, ISTE 2016, Google Innovator Academy (#COL16! ), and reading many EduBooks, my head is swimming with ideas and things to try. Really, I want to do all the things. I know that’s not practical, and I’ll drive myself insane trying to do everything, all the time. So, where do I start? My schedule for next year is: 3 periods of 7th grade science, 1 period of 8th grade AVID, 1 period of “Blended Learning Specialist” or technology resource. I’m picking a #onenewthing for each different aspect of my teaching day. I’m hoping these goals will keep me focused throughout the school year. I’m expecting my goals will change, evolve, or completely flip over time, and I’m ready and willing to reevaluate as often as necessary. 7th grade science & 8th grade AVIDMany teachers at my school attended the Restorative Justice training last school year. I didn’t sign up because I had been out of the classroom for other trainings way to much, and I knew it wouldn’t be wise to add yet another thing into my brain. From what I’ve heard, there will be more trainings and focus on restorative justice at our school this year. Instead, I bought The Restorative Practices Handbook and Restorative Circles in Schools and read them over summer break. 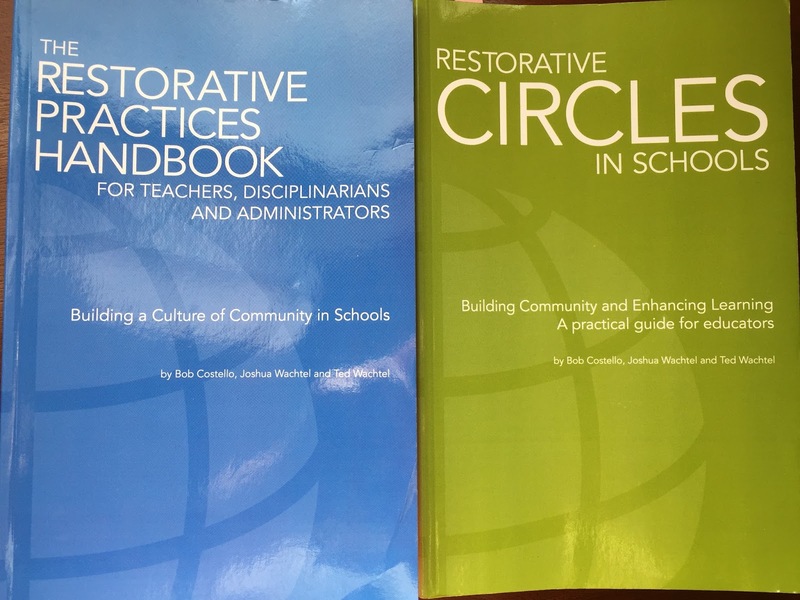 After reading through both books, I realize I do some of the ideas of restorative practices, but there is also a lot I can work on in individual and small group conversations with students. I am going to use restorative circles in my classroom as needed, and also implement Friday Family Time. Friday Family Time is my middle school spin on the elementary school “morning meeting” that many of my friends use in their classrooms. I always saw it as something I wish I could do, if only I had the time. I do have the time, because the benefits will far outweigh giving up my 30 minute period each Friday–time that is usually not well-spent anyway! I have no set plans for Friday Family Time, except we’ll all sit in a circle together, and I’ll either put out a question for each to answer (using some sort of talking marker, I’m thinking my mini stuffed penguin) or discuss things that happened in the past week or what is coming up. I’m hoping that once I put the structure in place, students will help me grow and mold it to our needs. Ok, so I actually have #twonewthings here, but they are distinctly different. In my BLS period, my goal is to spend less time in my own classroom, and more time working with teachers in their classroom. I have no idea how to go about implementing this with teachers, so I will be relying on the #TOSAchat community to guide me through this. I did it a little bit last year when teachers requested, but I don’t feel like I maximized my time for the benefit of the entire school. I’ll continue with our Tech Tuesday lunch club, and use that as my launching point for more specific one-on-one interactions. My second goal is to grow our Viking Tech Crew (previously called Genius Bar) student club. I have a new leadership team who are excited to take on projects and help out students and teachers. I am working with a few TOSA/teacher friends to develop a more comprehensive student badge-based training for technology-related skills. I’d love to see my VTC students continue to develop their leadership skills and take ownership of their club. In science and AVID, there are plenty of things I’m planning to try, test, and experiment with. This includes more regular use of social media in class, working more with scientific phenomena, improving on flipped learning, digital badges, and blogging with my AVID students. I had a blast in the 2015-2016 school year, with so many new opportunities. I’m beginning this school year with the same excitement! I’m back to work on Monday, July 18th, and students return on Wednesday, July 20th!